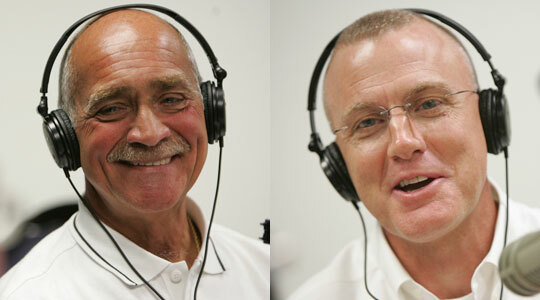 Summary of today’s show: Kevin Winn and Jim, two of the 13 candidates for the permanent diaconate in the Archdiocese of Boston due to be ordained next month discuss with Scot and Fr. Chris their vocational journeys, how they discerned the call, how important their wives were to their decisions and their formation, and what they expect from their future ministries. 1st segment: Scot welcomed Fr. Chris O’Connor back to the show. He recalled that in May they had seminarians on the show just before their priestly ordinaiton and today are two men just a few weeks before their ordination to the permanent diaconate. Fr. Chris said it will let them draw distinctions between the transitional diaconate for the road to priesthood and the permanent diaconate. Scot was also guest blogger on Cardinal Sean’s Blog last Friday describing the work of the Archdiocese of Boston’s Catholic Media Secretariate, including The Good Catholic Life. Fr. Chris is preparing for the academic year at St. John’s Seminary. On Sunday night, 26 new men will arrive at the seminary, one of the largest classes he’s seen in the 8 years he’s been at the seminary. Bishop Kennedy will celebrate Mass for them and friends and family, then orientation will begin. They will look at the four pillars of the seminary life: the academic, pastoral, human, and spiritual. A new diocese is joining the seminary: Hartford, Connecticut. There Redemptorist religious order is also sending its seminarians to St. John’s. Two men from another Vietnamese diocese will also train at St. John’s. After these messages, we will meet two of the 13 men to be ordained in September for the Permanent Diaconate. 2nd segment: Scot and Fr. Chris welcome Kevin Winn and Jim Leo. They are within 3 weeks of ordination. Kevin said it’s an exciting time for him. He’s going through the gamut of emotions. He’s preparing to serve God in a different way, in a vocation he’s felt called to. Jim said he’s nervously excited. With Christ at the center of his life, he’s grounded in prayer and knows that this is the right thing. He can’t wait for September 17. Fr. Chris asked Kevin about the signs that God was calling him to the diaconate, especially for those who might be wondering if they are called. Kevin said he doesn’t think there’s a single moment. As he grew as a Catholic, he was welcomed to St. Joseph Parish in Kingston and they became involved in parish life. One day at Mass, he asked the pastor why there were no altar servers. He said there was no one to train them and “thank you very much.” That was the beginning of his involvement in parish life, religious education which turned into youth ministry and retreat work. All the while God was converting and transforming Kevin, unbeknownst to him.God has healed Kevin in so many ways as a person and shown him who’s he’s been created to be. Kevin said he also grew in his prayer life. Eucharistic adoration as well as Our Lady and the Rosary were important for him, helping to realize what God has done for us. A deacon and other priests he’d worked with had asked him if he was interested in the diaconate. He felt a gnawing that turned out to be a calling and throught prayer it became a sense to look into it. Fr. Chris said wives are an important part of the formation, including the classes. How did they break the news? Kevin said his wife is his best friend and she’s the one who has taught him about God’s love in her patience and kindness and willingness to do for others. She’s been the quiet steady rock and confidant. When the idea of diaconate came, they talked about and she thought it would be a great idea for him because of his love for the Lord and his heart and passion. The wives are irreplaceable part of the formation. They are present in all the classes, some more than others, depending on what’s going on in the family life. When the candidates talk about formation, it’s not just the candidates, but it’s also as much about the wives. When they begin formation, they are told their first vocation is to their marriage. Jim said he’s been married 36 years and his wife Vivian is his best friend. He grew up in East Boston, Our Lady of the Assumption Parish, he felt Christ calling him then. He went to Catholic school and met Vivian and she wanted him to go on a Cursillo retreat. ALthough he balked at first, it was a great experience and he wanted more. He then went deeper in his faith and the low fire grew higher and higher in him. A deacon of his acquaintance encouraged him to explore becoming a deacon and his spiritual director reinforced the idea. The minute Jim mentioned it to Vivian, she said go for it. Scot said the diaconate program is a rigorous 4-year program that studies the faith both broadly and richly. Jim said his wife went to every single class. For the first year, the wives need to go to every single class, but after that they don’t need to go to every class, as Kevin said. Jim said he would ask his wife how they could get through this, but Vivian encouraged him and was his strength every step of the way. Jim said Fr. Bill Palardy taught a class on Patristics, the study of the Church Fathers, and it was truly eye-opening with a tremendous amount of learning. Kevin concurred and said it was one of the hardest classes he took. He loved it very much. He agrees with Jim that he used to think he had a fair handle on his faith, but learned how much more he had to learn and has to learn. This relationship with Christ is ongoing and ever-deepening. Fr. Chris asked what sort of skills from being an air traffic controller he brings to the diaconate. He said communication will be a gift. He loves people and to communicate with them. The reality of the job is that they communicate with people and provide a service to the pilots and passengers. He noted St. Josemaria Escriva’s philosophy of finding holiness in what we do. Jim is a civil engineer by trade. He worked for the City of Boston for 41 years and dealt with the public every day. How he dealt with the public, he will deal with the people of his parish: a sincere heart, listening to people. Listening is the number one skill to help people and settle problems. In his job, he had to settle people down when they had problems and reassure them. That skill will help in his ministry. 3rd segment: Scot said there are 213 permanent deacons in Boston and 13 more will be added in September. Kevin said the difference between transitional and permanent is t hat the transitional diaconate is a step on the way for men called to the priesthood, and the permanent deacon is a man called to service in the Church as a secondary vocation. Sometimes the primary vocation is a vocation to the single life and sometimes to marriage. They are called to the threefold ministry of sacrament, Word, and charity. They have a unique place in the Church in that they have a secular job as well as an office within the Church and it’s a blessing to the Church to be able to be that bridge. Fr. Chris asked what ministries the deacon does. Jim said he and his wife are on the baptismal coordinating team at his parish and in one month he will be baptizing children with his wife as part of that ministry. Deacons also proclaim and preach the Gospel at Mass. Scot said earlier this week at the Pastoral Center where all the deacon candidates professed the faith and took the oath of fidelity in a ceremony with Fr. Tom Foley. Kevin said every step closer to ordination brings with it more joy and emotion and excitement. They represented their letters of request to Cardinal Sean through his representatives that were present. The letters were handwritten and their wives wrote letters as well. While their formation was four years, their discernment was even five more years than that. Then they took an Oath of Fidelity on the Book of Gospels which was was held by their wives. Jim said that having his wife alongside him at the moment made him feel so lucky to have her by his side in this very emotional and spectacular moment. I, N., on assuming the office __ promise that I shall always preserve communion with the Catholic Church whether in the words I speak or in the way I act. With Christian obedience I shall associate myself with what is expressed by the holy shepherds as authentic doctors and teachers of the faith or established by them as the church’s rulers. And I shall faithfully assist diocesan bishops so that apostolic activity, to be exercised by the mandate and in the name of the church, is carried out in the communion of the same church. With Christian obedience I shall associate myself with what is expressed by the holy shepherds as authentic doctors and teachers of the faith or established by them as rulers of the church. And with diocesan bishops I shall gladly devote my energy so that apostolic activity, to be exercised by the mandate and in the name of the church, is — with provision made for the character and goal of my institute — carried out in the communion of the church. Kevin said being a deacon is not something you do, not something you put on on Sunday. It’s who they are, who God calls them to be as his servant. God reveals to them in their lives the people he’s forming them into. You are a deacon 24/7. Fr. Chris said it’s the life of every Christian. It’s not just something you do on Sunday. The Christian receives the Word of God and the Eucharist and then is sent back into the world to live the Eucharist that was celebrated. Jim said on the day of ordination, they will make a Profession of Obedience. They also make a promise of prayer. They pledge to pray the Divine Office every day at morning and evening. Kevin said it’s been awesome for him. While it’s required, he loves it. Like we are required to attend Eucharist on Sunday, but it’s something we should love and desire. The Liturgy of the Hours has been feeding him every day already. The Word of God is alive in the Divine Office. Scot said you don’t have to be ordained or a religious to pray the Divine Office. Some people also pray a form of the Office in the Magnificat. Kevin said the Liturgy of the Hours is the prayer of the Church. It is a reminder that God is the center of our lives and everything we extends from that center. Fr. Chris said it’s a reminder to us never to wander too far from the Lord, called back every few hours to contemplate the Lord. 4th segment: Scot said Deacons are ordained to a ministry of Word, sacrament, and charity. They serve at the altar, baptize, witness marriages. They serve the poor and marginalized, sick and dying, the imprisoned. Jim has been helping at Mass. General Hospital as part of his service. He started five years ago as a Eucharistic minister. They saw the hospital chaplain was looking for Eucharistic ministers for the patients. Then he served his internship as a deacon at the hospital as a pastoral visitor to the sick. He was bale to talk about Christ to people in their lowest moments. He saw how deep the faith of people were. Kevin said his primary assignment will be at his parish, St. Joseph’s, and his secondary assignment will be in the office of marriage ministry at the Pastoral Center. Jim said his first homily at his first Mass will be on the Gospel of the laborers in the vineyard, which is wonderful. Christ is there even at the 11th hour. Kevin said he is intrigued by God’s persistence in that Gospel, how he doesn’t give up on his, to continue to heal us and restore us, continuing the work he began in us at baptism. To a man who might be thinking about the permanent diaconate, Jim said he should ask for the application and pray on it. If it’s the right thing, you will feel the burning in your heart. Kevin said his other 11 classmates including all sizes, shapes, and colors, a great snapshot of the diversity of God’s people. You could clearly see the growth of their faith over the past year, especially in the homilies they gave in their homiletics class. Jim said the other men include doctors, a professor, an academic doctor, teachers, retired men, and more. It’s a cross-section.